Since clinical trials are experiments that study patients, they rely heavily on finding the right kind and the right number of patients. Clinical trials can be conducted only after enough patient information has been collected and treatment groups randomly assigned, so it is very important that researchers recruit enough people by the deadline. As the enrollment begins, however, it is often unclear how far along the current recruitment is: “Will we make it? Are we behind? Are we ahead of schedule? Where are we? ?” This kind of uncertainty makes it rather complicated to plan ahead and take measures to adjust the recruitment rate. Given the current number of recruits, wouldn’t it be great if we could predict how long it will take to enroll the remaining people so we could react without delay to add more centers as needed? Well, we can with predictive modeling. Where are we in the recruitment process? There are many predictive models developed by scholars to solve this problem; the easiest and most commonly used is the Poisson-Gamma distribution (Anisimov and Fedorov, 2007). That model assumes that patients enroll according to independent Poisson processes, each of which is defined by an unknown, nonconstant parameter lambda. Lambda is the recruitment rate (the number of patients recruited for each unit of time period), a measure that indicates how fast the recruiting is, and belongs to a gamma distribution with parameters alpha and beta, also unknown. These two parameters, alpha and beta, could be estimated with the enrollment data that researchers have in hand so far. Using the estimated alpha and beta and following the gamma distribution, researchers could then simulate different values of recruitment rate (lambda) and thus different values of remaining times that are derived from the lambdas. The mean, 2.5th percentile and 97.5th percentile of the simulations could be calculated from the simulations and serve as the prediction of the remaining recruitment. 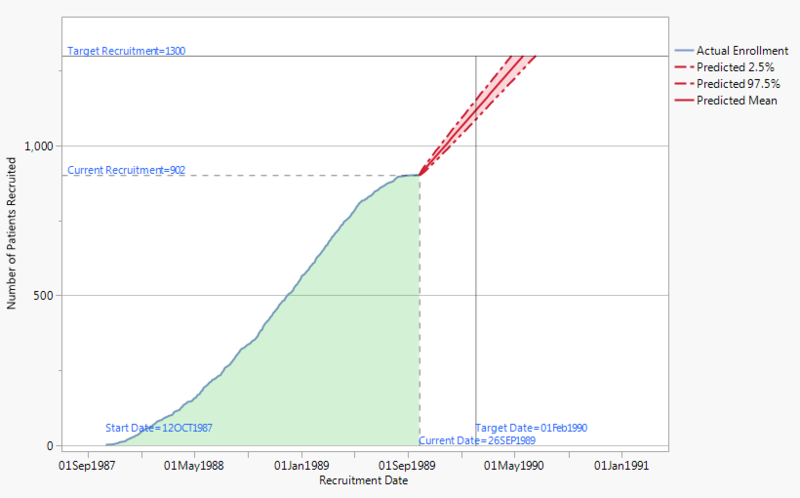 A graph of these simulations (Figure 1) gives people a straightforward and visual idea of how far they are in the recruitment process. How can I tell whether I will miss the deadline or not? If the predicted mean (marked by the red line) passes the target date, then does this mean I won’t be able to enroll enough patients? Or should I look at the percentiles? Well, give me a threshold probability with which you want your recruitment to meet the deadline, and I will compare it with the probability of the simulated remaining times that meet the deadline. If the probability calculated is greater than or equal to the threshold, then the current recruitment rate is acceptable to you. But if the current recruitment rate fails to meet your threshold, then additional centers are needed if you are to reach the recruitment target by the deadline. Okay, how do I know how many new centers to add? Excellent question! The model will tell you. 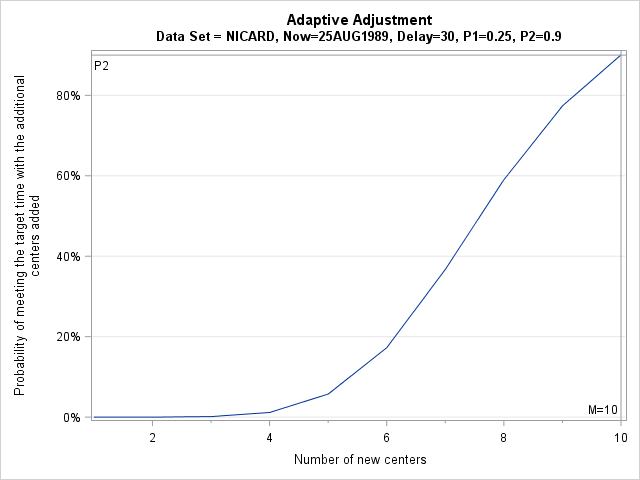 If the model finds it necessary to add centers, the adaptive adjustment will be initiated and the model will use the same simulation method to predict the new remaining time starting with adding one center. The initial number of new centers is one by default, but you can change it. The new remaining time includes the predicted remaining time with the new centers added and the amount of time delayed at new centers for them to come online. Then, the model needs another probability from you. You’ve given it the minimum probability of meeting the deadline with the current centers, so the model knows when to start adding more centers; the next step is providing a minimum probability of meeting the deadline with the new centers so the model knows when to stop adding more centers. The model calculates the probability of new simulations that meet the deadline with new centers added and compares it with the second minimum probability you specified. It will keep adding a new center if the former probability is less than the latter, until they are equal or the former is greater than the latter. In this way, the model has found the least number of additional centers that meets your minimum standards so that you reach your enrollment target by the deadline at the same time. 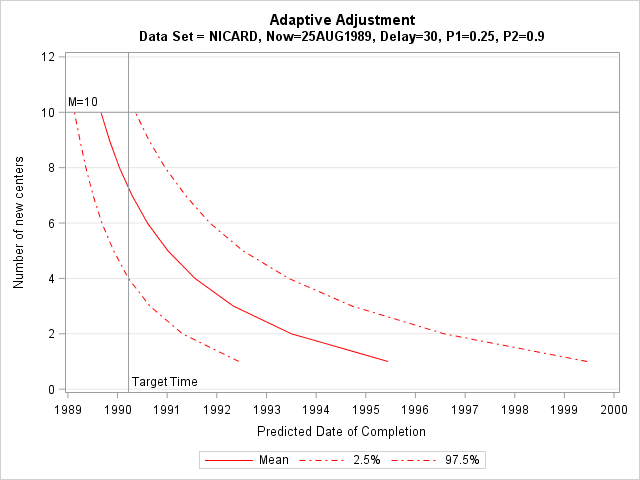 The table and graphs below illustrate the entire adaptive adjustment process. 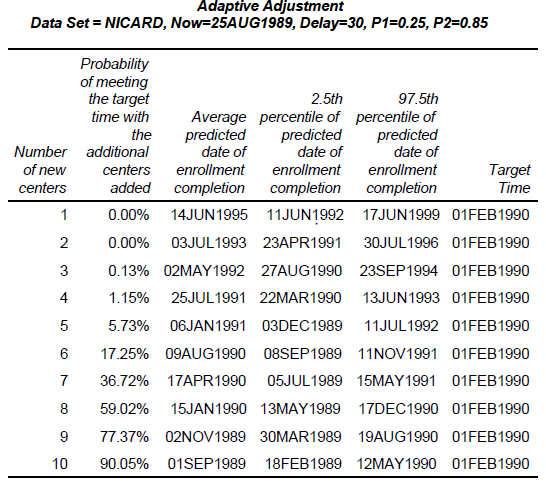 Note that the two probabilities that you need to specify could be the same (when you have the same requirements on the probability of the simulations reaching the target date with and without the addition of new centers). This predictive model for patient recruitment at multicenters is powerful and adjustable. It gives you a clear idea of what your recruitment has been like and how it will be in the future -- plus, you can customize it into the standards you want by changing the options. All you need is data on participant recruitment of an ongoing clinical trial, which allows you to assess and adjust recruitment strategies to keep your trials on schedule. I created the graphs and table with JMP Clinical (Demographics and Visits > Patient Recruitment). JMP Clinical also has a set of other predictive tools available for your clinical trial analyses. Figure 1 suggests that actual recruitment has flattened out. Why does the extrapolation say that the slope will increase? very nice, would be interesting to see how this performed against some real recruitment data and how one could include additional parameters. Hi, Emil. Thank you very much for your interest! In short, JMPC uses the entire green area to predict future recruitment. Even though it has flattened out a little bit at the end of the current recruitment, the overall recruitment rate is still relatively high and thus the predicted values will increase with that rate. If you only use the most recent data (say the past six months), you will see a flatter slope because the flattened out part becomes more influential. Please feel free to email me if you have more questions!